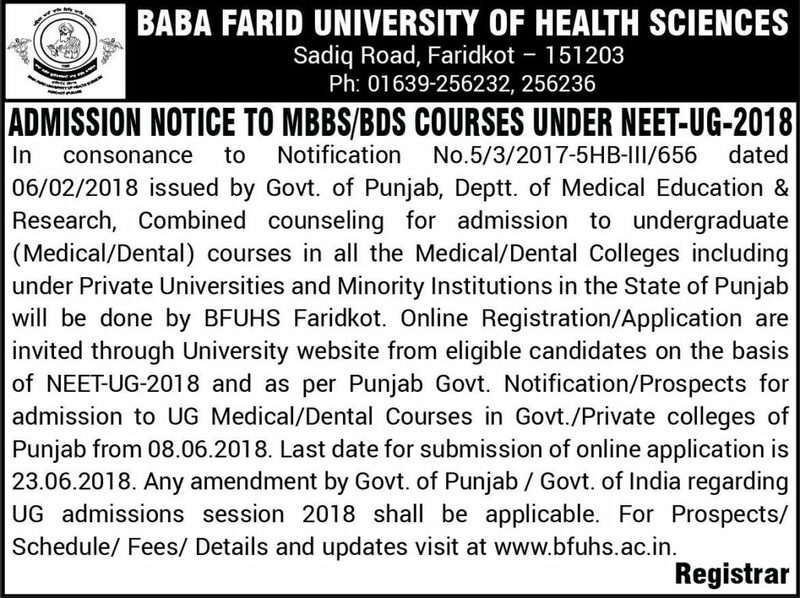 Punjab NEET State Quota MBBS BDS Counselling: Baba Farid University of Health Science Faridkot, Punjab is the official authority for admission in MBBS/BDS courses under NEET-2018. University will conduct online counselling for 85% reserved seats of MBBS/BDS courses. In order to get admission in Punjab, candidates have to apply first for the counselling. Recently, University has invited online application form for MBBS/BDS courses. Eligible candidates can fill the registration form which is available from 8th June 2018 on the official website of Baba Farid University of Health and Science. The last date for submission of online application is 23rd June 2018. Candidates are advised to visit the official website to know more about admission and counselling procedure. All eligible candidates can fill the online registration form which is available from 26th June 2018. After completing the online registration, the university will publish the state quota merit list for MBBS/BDS courses. 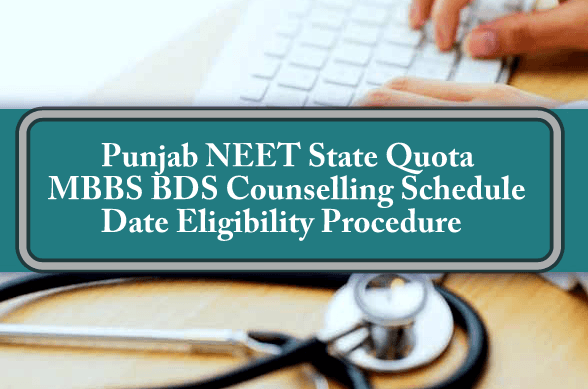 And on the basis of this merit list, Punjab NEET State quota counselling 2018 will be conducted. Category wise cut off will be published along with the merit list. Candidates are requested to upload their photograph, signature, thumb impression and other documents in time to avoid inconvenience. Filling more than one application form may cause rejection of your application. Application form will be automatically locked after cut off date and get print after that. Uploading Compulsory affidavit is mandatory with application form in first step, otherwise, application form will not be accepted. It is important to fill the registration form to appear in state merit list. According to the official notification, state quota merit list will be published just after the registration completion. All registered candidates will be able to check their state rank and merit list which will be available on BABA Farid University of Health Sciences official website. After publishing the merit list, University will announce the state quota counselling schedule and procedure. We are hoping counselling schedule will be available just after the merit list announcement. All Candidates are advised to keep their documents ready for the verification. We have listed all important documents which will be asked for the verification. So make sure to have these documents before the counselling. My NEET Score is 519, will i get any government college in Punjab?